If you are lucky enough to have a North Queensland lawn that receives full-sun, then Queensland Blue Couch from Harden Park Lawns might be the ideal choice for you. Strangely enough, Queensland Blue Couch is neither originally from Queensland, nor is it a true couch turf variety; but it is blue – ish. Originating in South Africa, this turf has been adopted by Queensland and earned its name due to its suitability to the local environment particularly as it has excellent salt tolerance, traffic tolerance, and it less aggressive than ‘true’ couch varieties. With a deep bluey-green colour and a soft, comfortable and fine texture, the Qld Blue Couch is suitable for both domestic uses and commercial uses such as public spaces, schools, child-care centres, parks and sporting grounds. Queensland Blue Couch is also suitable for a wide range of soil types making it a great all-rounder. Infrequent but deep watering will encourage a strong root system and healthy lawn but if it experiences an extended dry period it will rapidly respond to rainfall. The Queensland Blue Couch does require regular maintenance to ensure it thrives but doesn’t need a lot of fertilisation or de-thatching. This variety of turf mows beautifully, not leaving that scalped look that can occur with other couch varieties and since is less aggressive, it doesn’t thatch as quickly either. If you install this popular lawn it’s important to remember that this turf variety is not a couch – it will ensure that you do not make some costly mistakes or take advice which may be harmful to the health and vitality of your lawn. One of the most important areas where this is true is when using herbicides. Some herbicides that work without problem with real couch lawns can kill Queensland Blue lawns. Choose herbicides, fertilisers and insecticides with care and also refer to your lawn as ‘Queensland Blue’ when seeking advice. 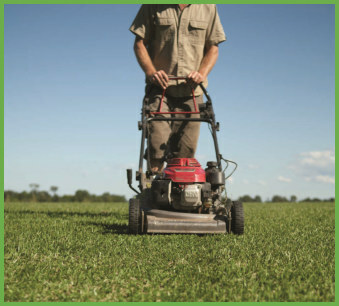 For more information on Queensland Blue or to place an order for your new domestic or commercial lawn just contact the team at Harden Park Lawns today.